This is the back of St. Paul’s Chapel, where I volunteered during the recovery effort. The city put up this ramp so people could look into the hole where the towers once stood. 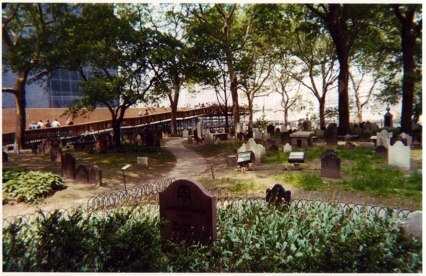 It always struck me, watching people walk over one graveyard to look into another. This must have been taken in the Spring of 2002. I’m heading down to St. Paul’s Chapel later. I hope to see lots of old friends and have happy pictures to post tonight.